In fact, Daguerre had been searching since the mid-1820s for a means to capture the fleeting images he saw in his camera obscura, a draftsman’s aid consisting of a wood box with a lens at one end that threw an image onto a frosted sheet of glass at the other. In 1829, he had formed a partnership with Nicéphore Niépce, who had been working on the same problem—how to make a permanent image using light and chemistry—and who had achieved primitive but real results as early as 1826. It was not until “1838 had Daguerre’s continued experiments progressed to the point where he felt comfortable showing examples of the new medium to selected artists and scientists in the hope of lining up investors. François Arago, a noted astronomer and member of the French legislature, was among the new art’s most enthusiastic admirers. He became Daguerre’s champion in both the Académie des Sciences and the Chambre des Députés, securing the inventor a lifetime pension in exchange for the rights to his process. 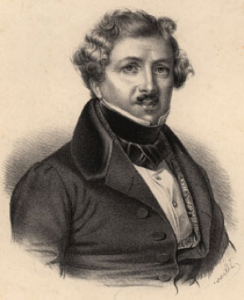 Daguerre died of heart failure on July 10, 1851. See a demonstration of a Daguerreotype photograph in this video. ← Will We Ever Need It Again?